Rajasthan Royals (RR) will take on Royal Challengers Bangalore (RCB) in the 14th match of Indian Premier League - IPL 2019 on 2 April 2019 at Sawai Mansingh Stadium, Jaipur. As far as weather is concerned, it will be a good cricket playing evening with the temperature around 30°C with low humidity. Jaipur pitch could be a little two-paced. Some dry areas, and some grassy areas, but don't be fooled - in sultry weather like in Jaipur, pitches play better than they look like. It's going to be pretty good for batting. 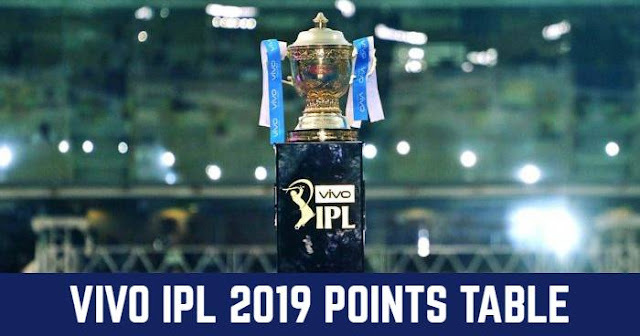 Both, Rajasthan Royals and Royal Challengers Bangalore have played three matches each but are yet to taste any success. Both sitting at the bottom of the points table. Ashton Turner might be replacing Steven Smith for the Rajasthan Royals. Varun Aron might also find a place in playing XI might be replacing Jaydev Unadkat or Dhawal Kulkarni. Royal Challengers Bangalore are lacking strength in their bowling department, Nathan Coulter-Nile or Tim Southee might replace Colin de Grandhomme and Mohammed Sirja may be replaced by Washington Sundar. Royal Challengers Bangalore (RCB) and Rajasthan Royals (RR) have played 19 matches against each other in Indian Premier League (IPL), with 2 matches abandoned due to rain. In 17 matches, Royal Challengers Bangalore have won 8 matches and Rajasthan Royals have won 9 matches. In last 5 matches with the results, Rajasthan Royals have won 3 matches and Royals Challengers Bangalore won only 2 matches. Last time they met was in IPL 2018, in which both matches were won by Rajasthan Royals. 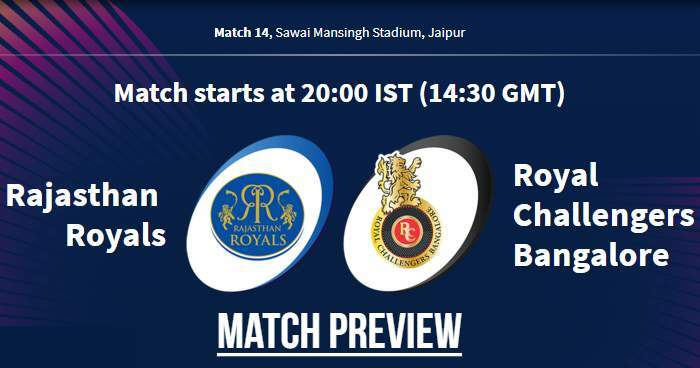 Rajasthan Royals and Royal Challengers Bangalore have played 6 matches against each other at Sawai Mansingh Stadium, Jaipur; both teams have won 3 matches each. Since the start of IPL 2017, Royal Challengers Bangalore have a 4-10 win-loss record when playing outside Bengaluru. The team batting first has won 5 of the last 8 IPL matches played at the Sawai Mansingh Stadium in Jaipur. The Rajasthan Royals captain Ajinkya Rahane has won all three tosses this season. Virat Kholi will be leading RCB for the 100 IPL matches. Virat Kohli will become the third player after MS Dhoni and Gautam Gambhir. Virat Kohli’s batting average of 21.27 against the Rajasthan Royals – his lowest batting average against all IPL teams. He has scored only 2 half-centuries in 17 innings against RR. In six innings in Jaipur, Kohli hasn't crossed 40 and has a SR of 94.74. Playing XI for RR: Ajinkya Rahane (c), Jos Buttler (wk), Sanju Samson, Steven Smith, Ben Stokes, Rahul Tripathi, Krishnappa Gowtham, Jofra Archer, Dhawal Kulkarni, Varun Aron, Shreyas Gopal. Playing XI for RCB: Virat Kohli (c), Parthiv Patel(wk), Moeen Ali, AB de Villiers, Shimron Hetmyer, Marcus Stoinis, Akshdeep Nath, Umesh Yadav, Navdeep Saini, Yuzvendra Chahal, Mohammed Siraj.